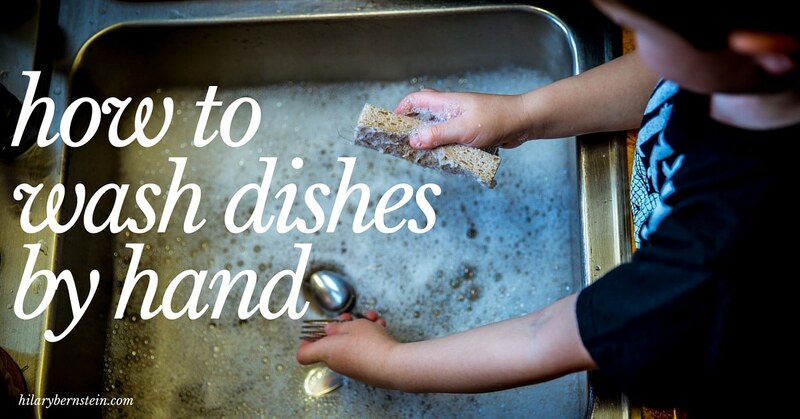 Learning how to wash dishes by hand isn’t difficult, especially with this step-by-step process! Washing dishes by hand may be a choice you make after your dishwasher is halfway through a cycle and you want to clean up your kitchen. Or, if your home has no dishwasher, you have no choice but to wash dishes by hand. Since becoming a homemaker, I’ve lived in seven different homes – three of them had dishwashers, four of them did not. In fact, the home I’m currently living in does NOT have a dishwasher. As I cook real food for my family of four each day, I dirty a lot of dishes – and I wash them all. I’ve had plenty of practice figuring out what works and what doesn’t. 1. In your sink, fill up a plastic dish tub – or just fill the sink – with hot, soapy water. Give a squirt or two of liquid dish soap into hot running water. Hot water will cut the grease and food, plus it will help prevent spots and streaks. Don’t squirt the soap directly onto a sponge or dishcloth. Don’t wash and rinse each item separately under a continually running faucet. Don’t use lukewarm water, except when it comes to starchy foods like potatoes – hot water will turn the starch gummy. You might like a kitchen sponge, but they also are notorious for harboring germs. You could also use a dish brush, steel wool, or a little plastic scrubber like the Lil’ Chizler – this small rectangle is a lifesaver when I need to scrub out baked on food! 3. Separate your dirty dishes into categories like glasses, plates, bowls, silverware, pots and pans. Scrape off any food. 4. Start washing the cleanest dishes and work your way to the dirtiest, greasiest dishes. Typically this means you’ll clean glasses first, followed by mugs, then plates, bowls, and silverware. Finally, when everything else is washed, tackle your baking dishes, pots and pans. 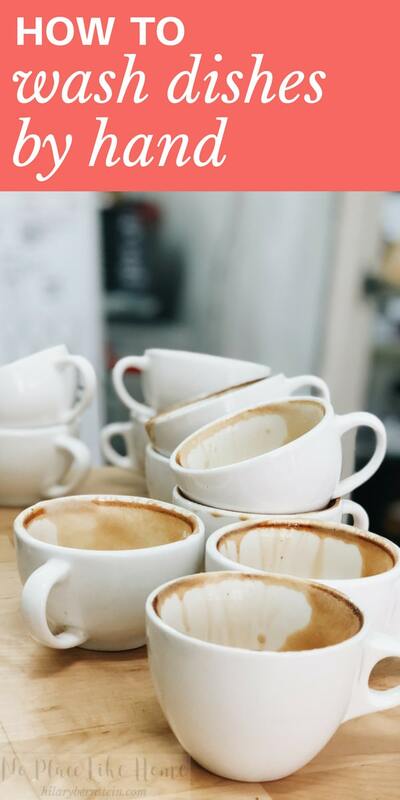 While I’ve heard you could wash your glasses first, followed by silverware – since both touch your lips when eating – I prefer to pile all the dirty silverware into a bowl and let it soak in hot rinse water. 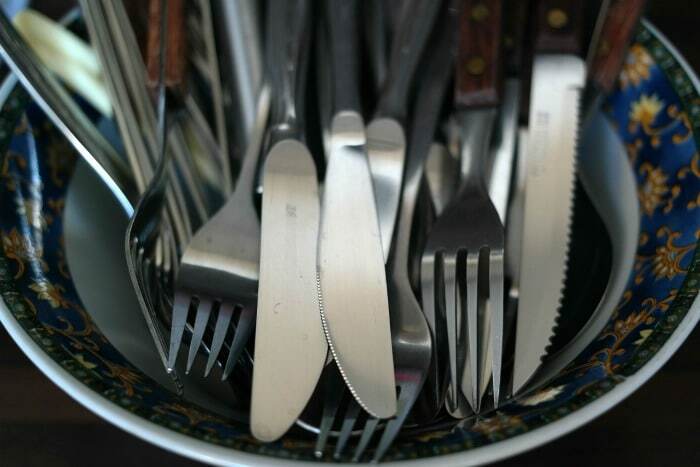 By the time I’m ready to wash the silverware, it’s not nearly as difficult to clean. As your wash water gets dirtier, cooler, and loses soap bubbles, drain the sink and refill. 5. Once you’ve washed your dishes and they’re clean, rinse them in hot water and arrange them on the drying rack to dry. Since I have a double sink, I fill one side with dishwater and the other side with dirty dishes. When I rinse my dishes, I rinse them so the water runs over the dirty dishes and gives them a quick soak to help loosen food. Like dish sponges and cloths, the kitchen sink can be a filthy place. Make sure you clean it well each day as part of your dish duty. 7. Finally, empty your drain catcher. You can air dry your clean dishes, or choose to wipe them dry. Once they’re dry, put them away! If at all possible, wash your dishes as soon as your meal is over. Your food won’t get caked on, your dishes will be easier to wash – and the chore will be finished. 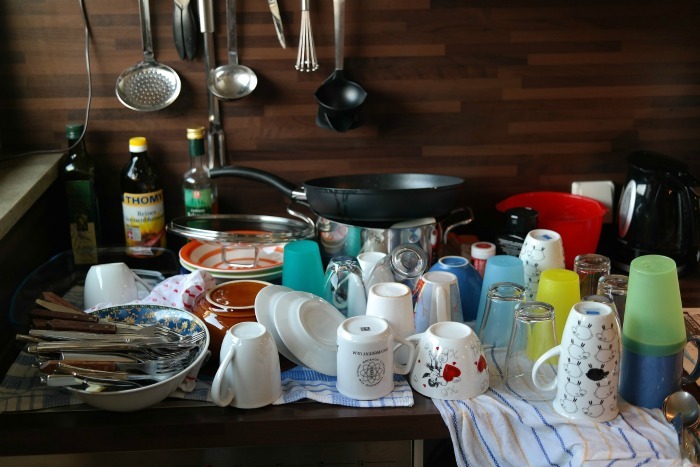 If you simply can’t wash your dishes right away, rinse each dish with warm water to remove as much food as possible – then stack your dirty dishes until you have time to wash them. When pots or pans have baked-on or burned-on food that doesn’t seem to come off, fill the pot with tap water and baking soda (a ¼ cup of baking soda works well). Boil, then remove from heat and let soak for a couple hours. Scrape the pot with and wash as usual. Depending on how bad the pot is, you may need to repeat the process a couple times. By following these simple tips, now you know how to wash dishes by hand! You do it just like my mama taught me. Thank God I have a dishwasher now. Such great tips! Thank you! Pinned this. I can’t believe you actually have to teach hand washing dishes! I’ve done dishes by hand most of my life. We often use this rule as well: if you cook, someone else cleans up. We have a dishwasher, which we use, but often we need to wash the pots, etc. If we hand wash dishes (a good time to talk with kids who are helping), I will often put the silverware in the sink while I am doing the glasses, mugs and they soak so I basically have to just rinse them when the glasses are done. I like the idea of sprinkling the grease with salt. It works like as charm as does the baking soda boil, which I have also used. I used to hate hand washing dishes, but not anymore. It is a time to think over the day, pray and talk to my “helper”. I have an extra refrigerator rectangular tray, left from my old refrigerator, and I keep it on the counter to the right of my sink. It corrals odd pieces that I plan to hand wash. After meals my husband clears the dishes and rinses them, placing in the sink. Then I load the dishwasher, wash any needing hand washing, and wipe down all counters and the stove. Works like a charm and I “get” to do all the dishwasher loading and unloading, which I prefer.